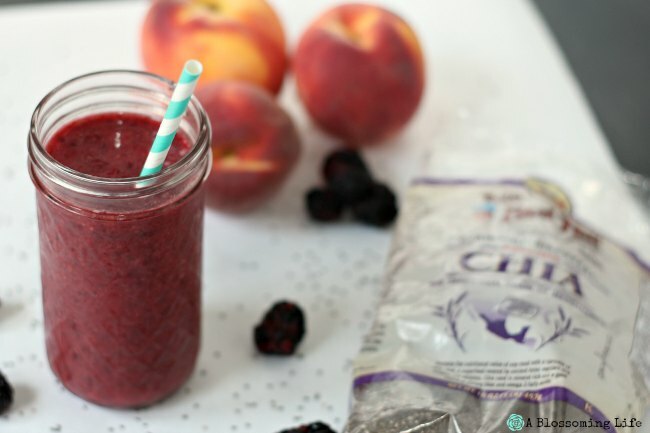 Refreshing berry peach smoothie is made with kombucha for a sweet and sparkly twist on the classic. 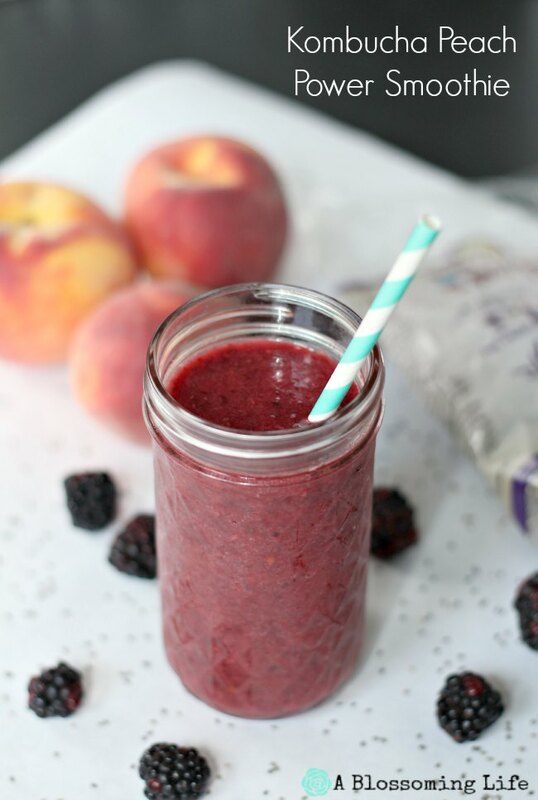 Packed full of nutritious ingredients, this peach smoothie recipe will put an extra boost in your morning or afternoons. Follow my tips below to making this healthy recipe. If you have 5 minutes and a few simple ingredients, you can make this delicious and refreshing probiotic smoothie. Summer in southern Illinois gets me excited for two things: berries and peaches. And definitely not excited about the mosquitoes, but we will just ignore that part. If you want some amazing peaches, nothing beats southern Illinois peaches. I count down the days to amazing peaches. So juicy and sweet, there is truly nothing like it. The next part of the smoothie gives it a slight twist- Kombucha!! 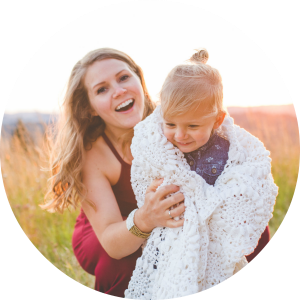 I was trying to figure out a way for my hubby to get probiotics since he can no longer eat dairy, and being the cheepo frugal gal that I am, I didn’t feel like purchasing pills. One afternoon we went to a friends house and her husband dared us to try it! Turns out we liked it, so we went home with a “SCOBY” and started brewing our own kombucha! If you’ve never made kombucha before it’s really simple and if you double ferment it, you can make it fizzy. Now if you don’t brew your own that is totally ok and you can use store bought kind. What the heck is Kombucha? Is Kombucha healthy? Kombucha is a fermented tea known to have many health benefits, although not many studies have been done to prove it. People have been consuming it for centuries, It’s packed with probiotics, B vitamins, and can help aid in digestion and boost your energy. Kombucha may not be safe for everyone. Pregnant and breastfeeding women should avoid drinking it due to the small alcohol content. Blackberries are high in antioxidants, vitamin C and K, can help reduce inflammation, help make your skin look longer, and improve your memory. Peaches are high in Vitamin A and C, potassium, antioxidants, and fiber. 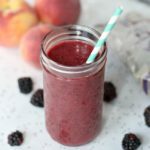 How do you make berry peach smoothie? Pit and slice peach. I just leave the skin on usually (this is where a lot of the nutrients are). Do you have to use fresh fruit? No. 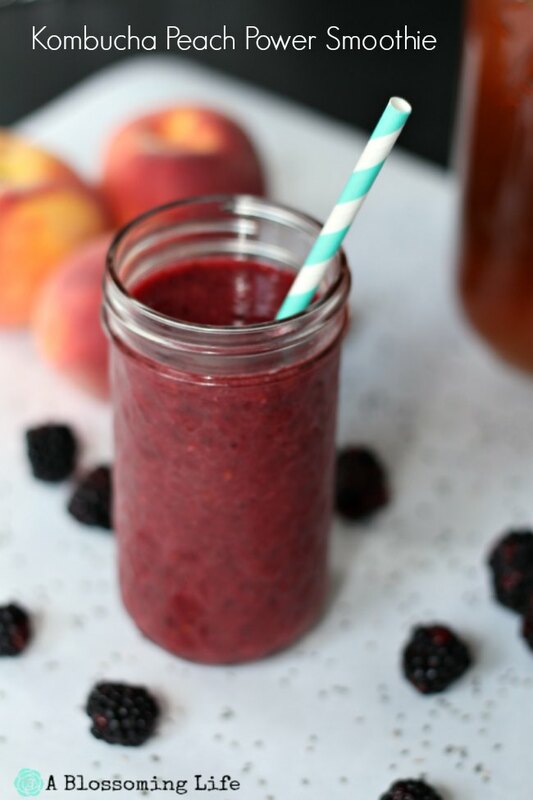 You could use fresh or frozen peaches and berries in this peach smoothie. I just like adding fresh ripe peaches because they are so sweet and we buy them basically by the truckload in the summer. Do you have to use kombucha? You could definitely make this drink without kombucha and use milk, a milk substitute, water, or juice. You may have to add more or less honey depending on the liquid you choose. Want more delicious drink recipes? Try these! 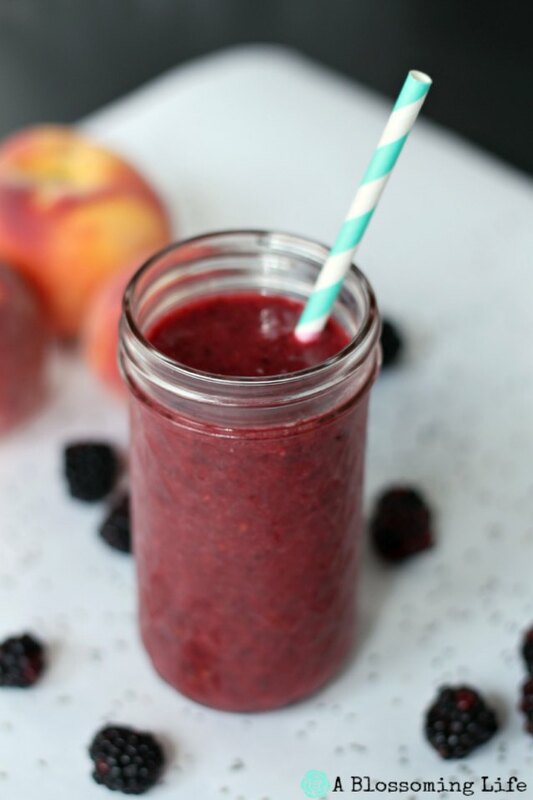 This delicious and sweet smoothie is packed with antioxidants, vitamins, minerals, and omega 3 fats. Eating healthy can be super tasty! Rinse fruit with water, shake off excess water, and pit and slice peach. Place all ingredients in a blender and blend until smooth. Enjoy your super healthy smoothie! Have you tried Kombucha? What is your favorite way to drink it? Yes, we’ve tried Kombucha. We had dinner at a friend’s home recently and they served a basic recipe that they made. My husband liked it a lot. Your blueberry-Chia recipe looks like a winner to me!